Dr Karen Blackmore is driven by problem-solving. From the application of Virtual Reality for industry, to girls participation in STEM Karen is always looking toward an innovative solution to society’s issues. 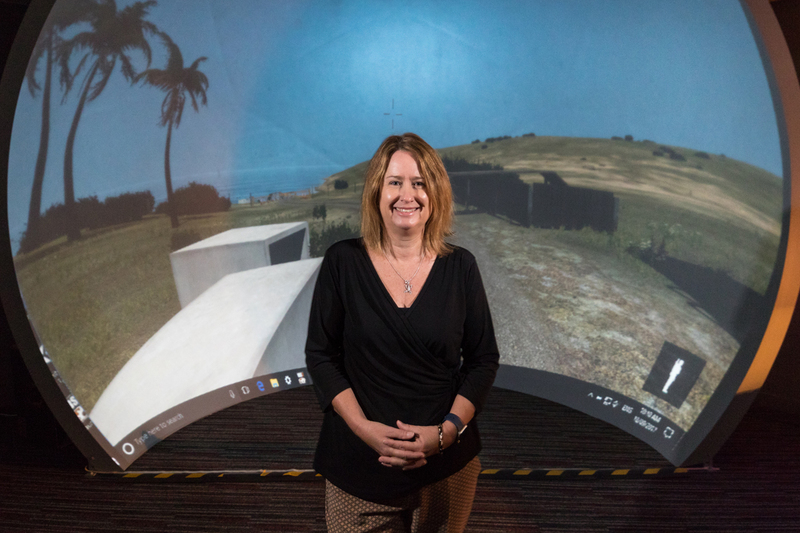 An early career as a special scientist has led Karen to some diverse and challenging fields, and Karen’s now moved from making maps to assisting industry navigate the maze of virtual reality to deal with the challenges of training for real-world problems. Gaming’s transitioned from being purely for fun, to taking a more serious stance, so it’s unsurprising that Karen’s moved into this space from a teaching and a research perspective. “As a spatial analyist I make 3D environments for a living, so the transition into this space was a fairly natural one. I teach game design and production and while students are very interested in those spaces, the job prospects are limited, so I feel the need to provide guidance in spaces where there’s a range of job prospects,” Karen says. One of the key areas utilising simulation and virtual reality for training is defence, and Karen’s forged key partnerships in the area. “I was contacted by the Director of the Defence Simulation Centre to do training for staff which has spawned a key collaboration at Williamtown where they do all the training for our UN Peacekeeping forces both locally and globally,” Karen says. Karen and her team are looking to help industry develop training scenarios that will allow a trainee to participate and then develop a set of skills that are transferable to real-world scenarios. Using a broach range or VR devices such as the head-mounted Oculus Rift and the HTC Vive, to the newly acquired iDome – which is a large format immersive display, the team are exploring which form of technology is best deployed in which situation. Universities are increasingly moving toward collaborations with industry – taking the knowledge and research formed in academia and implementing in society through collaborations with industry. As such, Karen and her colleagues Dr Keith Nesbitt and Dr Shamus Smith set up i3 Lab. Karen’s experience with gender stereotyping was highlighted during her career as a spatial scientist in the public sector. “I made maps for a living in a very male-dominated field, and if we feed in all the stereotypes of women: that they’re not meant to be good at reading maps, and we’re not meant to have strong spatial abilities, well, you can imagine the issues I faced…” Karen says with a wry smile. Despite the challenges, Karen’s still inspired by her early career: “I love the art as much as I love the science,” Karen says. “For me, that area in particular is about creative expression. There’s a lot of aesthetics and visualisation involved: understanding how we can best organise things so that people can understand. I see that the field itself would be enhanced with the addition of women: women bring a different perspective and a different set of skills to the field,” Karen says. “When I have 20 girls in a lab developing a mobile app it’s fascinating to see how they work together. As most of them don’t have a technology background the day’s as much about entrepreneurship as it is about coding,” Karen says. Karen’s latest project is co-founding HunterWiSE – where she has the opportunity to work with industry, partners, schools and communities alongside women in STEM to enhance opportunities and promote positive collaboration.